Original Review, May, 2008: The Chez Ray Sangiovese, 2004 (G4), was made from Lodi grapes, fermented warm, with a combination of French and American oak. 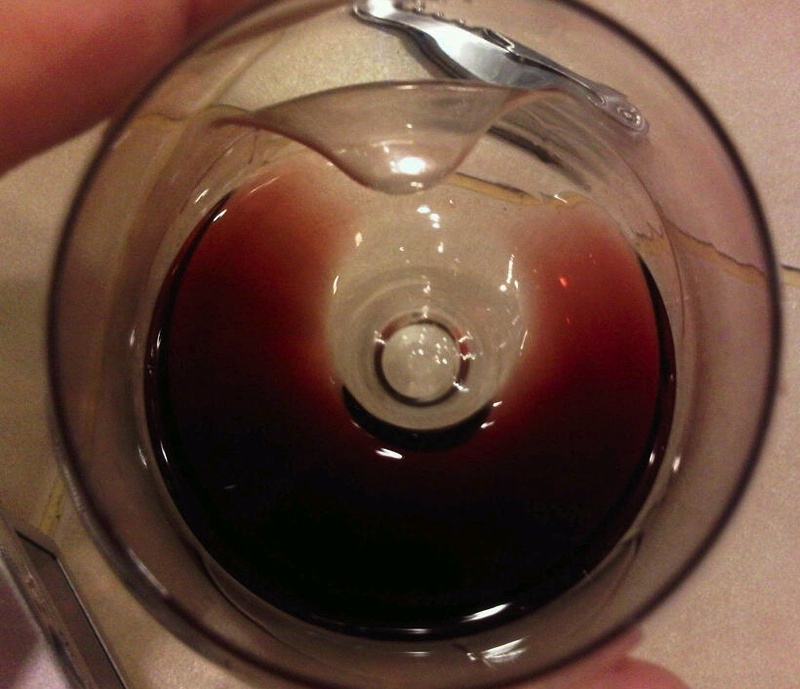 In the glass, it shows as a dark blood red in color. The nose hits as a deep, funky vegetable-fruit combo. The sip outshines the nose, however. There is a strong oaky start on the the palate, but this quickly resolves to a furry, intense cherry fruit. The "fur" is a tough tannic backbone still in place, signifying that this can sit for a few more years in bottle. Medium-length finish. Three stars out of five with a plus for intensity and promise for a longer-lived future. Updated Review, about a year and a half later, January, 2009: Color and nose have lightened just a bit. The palate comes to the middle with a clean, round red cherry. I don't notice the tannic backbone any longer, suggesting the Sangiovese may be coming of age. Also the intensity has faded. Now, an even, bright, mid-weight red. In effect, a pinot-noir alternative. I'd drop it back a touch to three stars without the plus at this point. Updated Review, about a year later, May, 2010: Now a hint of brick showing at the rim. Aroma and flavors consistent with earlier review. A balanced, dry red of medium weight, with a touch of minerality and dust. Still nice. Photo from this tasting. 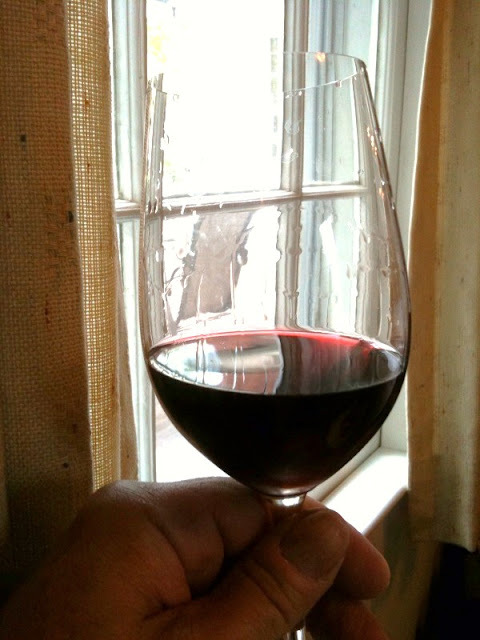 Updated review, another year later, June, 2011: Still a hint of brick at the rim of the glass. The nose shows muddled red fruit with a light oxidized overtone. The palate remains bright, red and clean, with hints of sand. Solid, and probably at its peak now. Another updated review, another two and a half years later, now a full decade from vintage year, January, 2014: Same color. Muddled middle red fruit. Nice, aromatic red fruit on the palate, with drips of violet. Yummy. Now four stars. Remarkable ager. Yet another updated review, almost five full years later, now almost 15 years from vintage date, late December, 2018: Same deep magenta color. Bright red fruit on the nose, becomes solid mid-bodied round red on the sip. Clean and bright and full on the finish. It's crazy how well this has lasted!! Let's hear it for the Lodi sangiovese! Grapes for the 2009 Chez Ray vintage arrived this weekend from Lanza Family Vineyards in the Suisun Valley, just southeast of Napa Valley, CA. I used Go-Ferm to reconstitute yeast, and built an approx half-gallon starter by adding crushed grapes during the course of a day. I'll get the ferment going at room temperature, then move to a cooler basement ferment after a couple of days. Basement fermentation proceeded at approximately 65 degrees F.
Deep magenta in the glass. Soft, perfumed blackberries on the nose. Roses and deep blackberries touch the palate on the first glance, moving across your tongue with deep, velvet robes. Depth with very gentle acids. Impressive. Four stars on the Spirit of Wine Scale. By way of background: This is the Chez Ray 2008 Underwood Mountain Pinot Noir, Washington (coded P8). Vinting notes are here. Original tasting notes, three years from vintage date, in 2011: Ray: color, light brick pink; aroma, shy light, hint tobacco; flavor, bright, spicy, clean, aromatic finish; 3. Karin: good finish; 4. Jim: color, light; aroma, raspberry; flavor, light fruit, deep finish; 3+. Eric: color, very light, more like a rose; flavor, banana-like aftertaste; 1. Rob: color, pink; aroma, tar; flavor, thin; 1. Updated review, now six years from vintage date, January, 2014: Remains light brick in color, showing a very shy and serious light red nose. The palate shows a light red balance of dry strawberry, clean laundry freshness and bright - almost sauvignon-blanc-ness - acidity. Three stars on the Spirit of Wine scale plus a big plus for its long-lived lightness of spirit. Updated review, now 10 years from vintage date, December, 2018: Same color: light brick! Dry candy/raspberry red nose. Interesting. On the palate, bright acids with a sweet strawberry wash. Fresh and friendly - more rose-like than red wine-like. Absolutely not past its prime. Find prices and retail availability for Alexander Valley syrah. Color is medium red, lightly bricking at the edges. Aromatics bring charred oak, with touch of clean, dark fruit. This may be reflecting the dark-toasted oak staves used in the process. On the palate, first note is a hot and sweet middle, fruit coming in second. Though the alcohol is indeed hot, the wine is still somewhat light on its feet, rolling and building around your tastebuds and up into your cheeks. I'll go with three stars out of five, using the Spirt of Wine scale. In what may be typical of this cool-fermentation technique, the wine shows a high-pitched, aromatic side along with its deeper body. Kind of like a pinot noir blended with a zinfandel. Following a full day's decant, the Chez Ray Alexander Valley Syrah, 2006, opened out quite a bit. Still three stars, but an improvement over the right-out-the-bottle pour. Suggests promise with aging. Often a full day decant (in wide-bottom decanter) is a bit too much for a wine to handle. Updated review, two and a half years later, April, 2011: Color has held fast, medium red with brick edges. The aroma is of medium weight, solid syrah, no longer dark. On the palate, a wonderfully balanced mushroom and medium dark fruit syrah, with lifting acids and just enough sandy tannins to remind you this wine still has bones. A full point jump to four stars. Remarkable improvement with a couple of years of age. Following long decant, several days in partially-filled bottle under vacuum at room temperature: Brighter metallic aromas now. Surprisingly, a touch brighter on the palate too, but with much of the same outstanding balance. Updated review, another two and a half years later, now seven years from vintage date, October, 2013: Same color; same solid syrah nose. Medium dark fruit on the palate, now reclining gently in the rocking chair; not old, but wanting to settle down. Still some brightening acids. Yummy red fruit. Medium red with some bricking at the edges - same color it has been for the last dozen years! Fresh, bold, vibrant black syrah fruit on the nose - absolutely lovely! Sweet black fruit on the palate, like slipping into a familiar velvet bathrobe. Starts with creamy blackberries and moves across your tongue with tannins that both accentuate and soften. Gorgeous. Hits a remarkable five stars at this advanced age! Find prices and retail availability for commercial Sonoma syrah. By way of background: Stage Gulch Vineyard Syrah from Petaluma, Sonoma CA for the 2007 vintage was made from frozen grapes procured from Brehm Vineyards, as code number 527 - 07SGS. For my collection, the finished wine is called SG7P, because it was fermented with Pasteur yeast. Here is the approach used to winemaking for this selection. In the glass: Stage Gulch Vineyard Syrah 2007 shows as medium deep velvet red in the glass, opaque at the center. On the nose: Poured cool with a brief decant and swirled vigorously, this Sonoma syrah brings an intriguing charcoal-broiled steak aroma forward, with plums and a touch of oak mixed in. On the palate: The first elements on the palate are a sweet, almost light red middle, buckled up with some charry oak. A meatiness moves to your cheeks, and alcohols come on towards the end, allowing the balanced light acids and underlying tannins to peek through. In summary: Overall, a full experience in a nicely darkened aromatic package. Rates three stars on the five-star Spirit of Wine scale. Updated review almost a year later, April, 2011: With long decant, color is consistent. Aromas are meaty and swampy dark fruit. Lightly charcoal-broiled black fruit comes to your palate, with peaks of red berries and depths of black cocoa. Gains a plus for its compelling layers, even if slightly disjointed. Updated review, another four months later, now four years from vintage date, August, 2011: Cleaner, red fruit nose. The palate has come together as well, showing clean red berry fruit, some oak, and a nice glycerin mouthfeel, even though it finishes squeaky clean. Updated review, over a year later, August, 2012: Deep medium red, now with elements of orange beginning to show at the edges. Soft, muddled red fruit and berry nose, with some very light laundry and menthol. Interesting, though perhaps a touch tired. Soft and full red palate, but showing a touch of age with minor hints of oxidation. Drink up. Updated review, over a year later, now six years from vintage date, October, 2013: Deep ruddy red. Soft, deep red on the nose. Palate is solid, subtle, light and acidic in the cheeks. Holding better than expected. Updated review, over five years later, now 11 years from vintage date, December, 2018: Still deep ruddy red. Soft, deep red berries on the nose, with light and appealing touches of earth and loam. Palate brings a wash of flannel-y deep red fruits across the palate, with acid wisps coming on at the close to tuck the fruits into your cheeks. Remarkably, no loss of liveliness. Background: We are sampling today the Chez Ray cabernet sauvignon and zinfandel 2011 blends described here. Both fermented warm, they were created based on this recipe. In the glass CZ11W is pink to light brick, a bit muddled in tone. The nose shows a bright, pink and sweet tone, also showing some white pepper. On the palate, fruity and tasting, with some oak showing. Brights a light core of light black raspberry with some light red cherry showing through as well. Clean, bright, friendly in its finish. On the Spirit of Wine scale, I'd offer three stars. Just a little too light to sport a plus for pleasantness. There were four equal parts to the blend: VSP Cabernet, Paso Robles Cabernet, Paso Robles Zin fermented warm, and Paso Robles Zin fermented cool. CZ11 shows consistent light/muddy pink/brick color in the glass, just a touch darker than the CZ11W formulation. Shy, but deeper, darker and more evocative nose. Seems purple and dark. The palate shows a deeper, fuller, more aromatic quality, showing violets and blueberries along with the lighter red fruit of CZ11W. Depth shows in the hints of charred oak and a finish that crawls up into your cheeks. Picks up an easy + on top of the three stars, and moves into close proximity to the four star mark. The VSP (vertical shoot positioned) cabernet sauvignon certainly seems to make a difference, along with the cool fermented zinfandel. Updated review, now two years from vintage date, November, 2013: Light muddy brick color. Full , fresh and deep charcoal aromas. Fresh, deep, sandy fruit with depth and aromatics. Gorgeous. Touches four stars and is ready to drink RIGHT NOW! We tried the MC7 as part of the 2011 blending party. Here are notes from that tasting: MC7 (2007 Carneros Merlot, Sonoma, CA): Ray: color, medium deep red; aroma, funky, deep and vegetative old world; flavor, oxidized, deep and bold; 3. Karin, 2. Jim: flavor, too dark; 2+. Eric: aroma, stronger than most, almost a hint of red licorice; flavor, strongly alcoholic, a bit fruity, but has an odd finish; 2. Rob: color, dark burgundy; aroma, metallic; flavor, metallic tannins; 3. Now, here's an updated review, May, 2012: Color is deep red. Soft and lightly funky deep red berries on the nose. Red berries and red licorice for miles on the palate. Interesting. Friendly and extracted fruity. 3 stars for this red intense experience. I pick up no metallic nor oxidized elements in this bottle. And further updated, now seven years from vintage date, January, 2014: ps, I think this was made with a combination of Pasteur and 254 yeasts. Deep red in the glass. Oak and deep red fruit show on the nose. Soft red berries on the palate. The richness and deep, fun, red fruit just bring me to 4 stars on the Spirit of Wine scale. Not at all tired. And even further updated, now 11 years from vintage date (pretty close to 12 years), late December, 2018: Some magenta, brick and opaqueness mingles with deep red in the glass. Deep red/black fruit on the nose, seems like less oak than five years ago. Still clean red fresh fruit on the palate. Remarkable ager. On its own current merits, I'd give three stars with a plus for the bright acidic tang following the fruit. Original Review May, 2007: This is wine made from a bag of grape juice! It is called the Selection Estate Woodbridge Ranch 11 Cabernet Sauvignon. I made it more or less following Winexpert instructions. Color is an even deep red. While swirling, grape juice aromas jump out of the glass. On closer examination, aroma is a mild liquor-like cherry, maybe like smelling the inside of a chocolate-covered cherry, but without the chocolate. The favor fills the mouth with a round, smooth touch, no complexity, no aromas, but big and round in the middle. Just a touch of cherry around the edges. And a finish that flits past you before you even notice. For comparison, here's what the manufacturer says about this bag 'o juice:"Our Cab has trademark black currant and cherry flavors, but its true triumph is the subtle weave of complex flavor compounds that contribute to the overall experience. Oak and tannins, pepper and spice, combining structure and rich fruit for a red wine that dazzle from first aroma to long elegant finish." Well, that sounds a bit "je ne sais quoi" to me! Updated Review, October, 2008: Still a nice mid-palate, round and cherry. Not enough before or after, though. In the glass: Deep blood red and purple, opaque from within about a quarter inch of the glass edge. On the nose: Poured without a decant and swirled vigorously, still has that cherry cordial element. On the palate: Think now more like a cherry caramel, sweetness lifts up and to the top of your palate, with light acids descending. And the finish: Seems a bit longer than I noted before, with light caramel drifting away. In summary: Not so bad an experience overall. I'd go with three stars on the five-star Spirit of Wine scale. It has actually held up pretty well to the four years in bottle. Updated Review, another year and a half later, May, 2011: More blood red than purple at the edge of the glass now. Cherry cordial on the nose with some broccoli creeping in. Still full and red caramel, but with a definite "over-the-hill" vegetative element creeping in. Better get to the rest of these soon. Updated Review, another seven years later, September, 2018: Color now looks much more like sherry than red wine. Aroma is shards from the woodshop. The palate is fresh and fun and sweet and easy going - somewhat winelike! Original Review, Jan 2014: Chez Ray Zinfandel, Lodi, California, 2006 (destemmed). The version fermented with stems is described here. It is first being sampled eight years from vintage date, January, 2014. In the glass: Medium red with pink highlights. On the nose: At room temperature, shows a shy, light clean purple nose. Seems like it will be bright and fresh. On the palate: Shows a more profound, aromatic, deep violet element than anticipated. Balanced notes of fruit, oak, tannins and acids, in an overall refined package. As aromatic and flavorful as the palate is, the finish is clean and dry. Overall, just touches an impressive four stars on the five-star Spirit of Wine scale, consistent with the version fermented with stems. Although I am not tasting the two versions side-by-side, from the descriptions I would say that the overall quality of the stemmed and de-stemmed varietals is consistent, but the stemmed version seems to carry a bit more minerality. Updated review, four years later, now12 years from vintage date, Sept 2018: Remarkably consistent color and nose, little sign of age. Still bright and fresh on the palate. Less deep color notes than highlighted before. Retains full freshness at 12 years of age. Inspired by this wine: Calling my best friend from school to come over and play some board games. 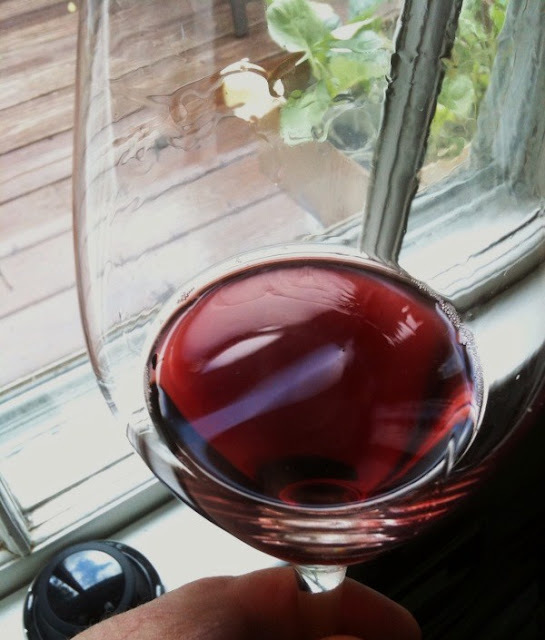 Now, in 2010, following several years in the bottle, it shows as solid mid-red in color, not quite opaque in the center. Poured cool with a brief decant, it shows a shy, slightly plumy nose, with the tiniest hint of savory earth. On the palate, a gentle, spritzy, sweet, red berry sleekness comes to the mid-palate. Tannins and acids are gentle. A touch of sweet red currant heat to finish. Just makes it to three stars on the five star Spirit of Wine scale. Updated review, almost two years later, September, 2012: Color is consistent. Bold purple, plumy nose. Still fresh, sleek, sweet red berry fruit. Clean and fragrant with sweet red currants. Easy three stars now. At prime drinking age. Updated review, about six years later, now 13 years from vintage date, September, 2018: Color is consistent, no signs of bricking due to age. Nose is subtle, bold and balanced red. Nice, knitted red velvet and wool cloth palate. Solid finish that shows just enough heat, acid and tannins. Just touches four stars. I'm very surprised by the longevity! Inspired by this wine: Me and my four cousins are headed down the dirt road to try fishin' in the pond we just heard about!